With A.D. The Bible Continues airing on NBC at the moment there's a little talk around about other films based on the Acts of the Apostles and, as it happens, today I received in the post a new book about Roberto Rossellini's whose own take on the book of Acts - Atti Degli Apostoli (1969) - is one of my favourites. There's not much in the book about the film but there are a couple of good quotes that I thought I would reproduce here. The other quote is from Adriano Aprà's chapter "Rossellini's Historical Encyclopedia" and is found on page 144. Acts of the Apostles is, in my opinion, alongside The Age of Cosimo de 'Medici and Cartesius, the best of Rossellini's television films. It is also the 'hottest', the one where the emotional involvement he renounces elsewhere is most visible. There is a broad sweep: the film starts from the centre, Jerusalem, and a community of brothers, the apostles, then gradually the circle widens. The apostles set out on their journey (like the friars at the end of Francesco); the conflict between Jews, Greeks and Romans, initially contained within the city, echoes along the route which takes the apostles and later Paul to Palestine, Syria, Pisidia, Athens and Rome, where the last scene in the films opens with the same invocation as the first (Jerusalem! Jerusalem!") and the circle is closed. Acts is the film of harmonic totality. The itinerary of the abstract idea is a concrete journey where the characters are cocooned by the surrounding space; the male community of the brothers is constantly given warmth by the silent activity of the women, who are frequently highlighted by the zoom; the dialogue, more than in the other films, is used to establish contact between people and try and overcome differences. Rossellini takes liberties with the text of the apostle Luke, synthesising, expanding, cutting and inventing to good effect. One of the most common criticisms of films about Jesus is that the actors chosen for the leading role are either too good-looking, or too white and, not uncommonly, both together. Recent years, though, have seen a bit of a reversal in that particularly trend and what with the performance of part-Tamil Selva Rasalingam in the Lumo Project's Gospel of John finding a wider audience this Easter and Lebanese actor Haaz Sleiman's potrayal in Killing Jesus actors of south Asian descent are started to provide a more ethnically correct Jesus. But before either of those productions got off the ground, Robert Savo's The Savior had already had its première and had been touring film festivals back in 2013. The film not only stars Israeli-born actor Shredy Jabarin in the lead role - which is of itself, I believe, something of a first - but all the dialogue is in Arabic. Whilst Jabarin's ethnicity and the filmmaker's decision to opt for a Middle-Eastern language are more quasi-authentic than fully authentic, it does make watching the film interesting and its certainly more authentic than the Hollywood Jesuses with their blue eyes and blond hair. Moreover it's not a bad little film. Jabarin's performance as Jesus may not quite be divine, but there's hardly a step out of place and he manages to add gravitas without getting dull or stodgy over being overly severe. Jesus smiles occasionally but he always feels like a man with a bigger, more pressing vision on his mind. 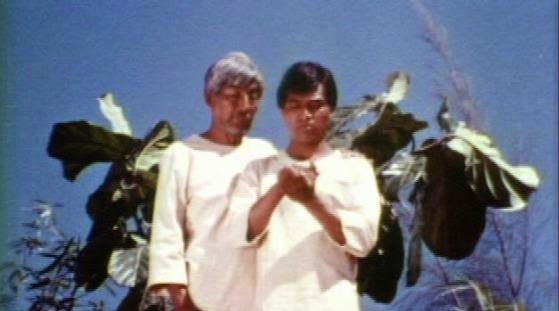 There is also some nice camerawork, notably the moment Jesus and the disciples emerge over the hill ready for their fateful trip to Jerusalem, good soundtrack and I particularly enjoyed the film's use of colour and camera filters. 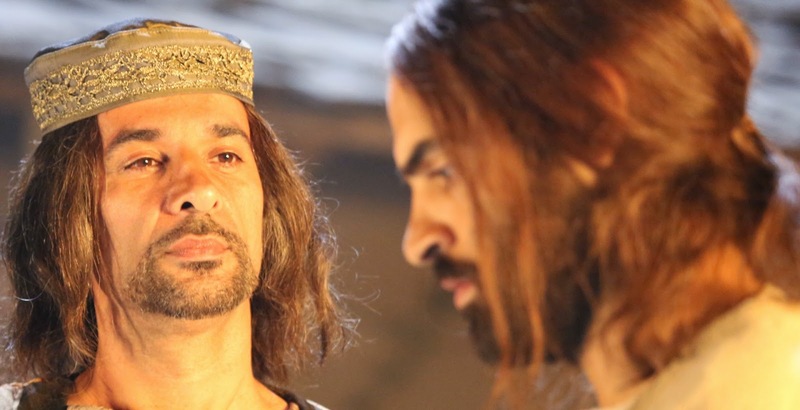 One of the things about Jesus films that is usually quit telling is seeing the episodes from his ministry that the filmmakers choose to include and here the film steers away from many of the scenes that appear in most of the other Jesus biopics. So there's no rescuing the adulteress, or Sermon on the Mount, for example. On the other hand we also get a few episodes from the gospels that appeared in a several of the early Jesus films, but have largely been absent ever after. So there's the exorcism in the local synagogue (Mark 1:21-28); the healing of the widow of Nain's son (Luke 7:11-25) replete with the film's best special effects; the mini-apocalypse of Mark 13; and the discussion with the Samaritan woman at the well (John 4). 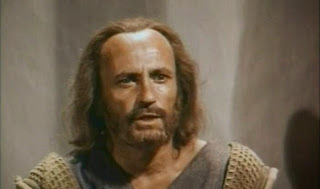 Indeed the film manages to pack an awful lot into the first hour or so before Jesus and his disciples arrive in Judea. The nativity story lasts only 15 minutes, the rest of the first hour deals with Jesus' ministry prior to his arrival at the temple. It's able to do this by a combination of economical scene selection combined with the decision to avoid embellishing the story wherever. Whilst it's an interesting approach it perhaps leaves the film a little light on drama and character development. The film tends to whizz from one scene to the next without joining the dots. Each of the scenes, in and of themselves, offer a fairly credible portrayal, but it's not always very clear what motivates the various characters. One major exception to this however is the long scene of the Last Supper and, in particular, the moment when Jesus washes his disciples feet. It suggests that this demonstration of humility is one of the key points that the filmmakers are trying to stress and that's highlighted still further immediately afterwards when the disciples argue over which of them is the greatest. There's a hint of this in John's gospel, but the contrast is made all the stronger by moving this incident here. Having said all that there are a few weakness in the film, not least the jarring and rather sporadic use of the narrator, and some of the special effects. The narration device - depicting an elderly Luke sitting down to write - feels very dependent on the Visual Bible's Matthew project and stresses Luke's role. It even opens by emphasising the lengths Luke has to go to just to prepare his ink. But this is a rare device in cinema in general and with good reason. I can see why emphasising the written nature of the text might appeal to those seeking to find common ground with the "people of the book", many of whom speak some form of Arabic, but it adds very little dramatically and the latter parts of the film are all the better for his general absence. The special effects are also rather mixed. Generally one can accept that a film like this is fairly low budget and may not have the money to invest in impressive special effects; a good film can work around those, indeed as I noted of Ray's King of Kings (1961) some bigger budget films do this anyway. The problem is that most of the effects budget seems to have been used up in the temptation in the desert scene and it doesn't really pay off. I'd be interested to know what proportion of the overall budget went on that scene alone. For some reason it's a common approach to go to town with special effects on this scene and yet the most effective treatments, for me at least, are those where there are no special effects, such as (another big budget film) The Greatest Story Ever Told. Having said all that the angelic scenes are more restrained and I did like the effect used when the widow of Nain's son was brought back to life. I'm quite intrigued to know how they did it. However, these are fairly minor complaints. Overall the film has a good sense of restraint and is built on fairly sound filmmaking principles. Most of the scenes work well not least because Savo seems to appreciate the restraints he is under and brings out the best with what he has. He knows for example, that many of his actors are not very experienced, so he places a great deal of weight on Jabarin's shoulders, knowing he is up to the task. The dialogue is dramatised but, aside from the narration, not allowed to get bogged down in any particular agenda. And after years of seeing English, American and occasionally European productions the film gives a sense of place, time and sensibility which whilst they may not entirely reflect the first century Palestinian context in which the stories occurred, certainly captures it in a way that few, if any, other films about Jesus do. I watched King of Kings (1961) on Easter Monday for the first time I what seems like a very long time. Whilst I've revisited certain clips in the intervening period it was good to take it in in it's entirety and on a large high definition screen, making those colours stand out all the more and doing justice to Ray's bold images and Jeffrey Hunter's blue eyes. Ray is perhaps best appreciated for his use of internal space and smaller' more intimate stories, so it's interesting that it's the big scenes that I most appreciate here. One such scene, that has always been one of my favourites is the historical prologue, voiced by Orson Welles. Many recent films have highlighted the story's context of the Jews living under occupation by the Romans, but rarely to the extent here. Pompey's victory is effectively year nought for this story, everything beforehand is largely irrelevant and everything afterwards is related to it. Welles' narrative seamlessly moves from narrating Pompey's invasion and the subsequent skirmishes into directly quoting Luke's "historical" prologue to the nativity story as if they are cut from the same cloth. But of course Ray is essentially doing to his gospel what Luke has done to his - prefix it with historical gloss to give a sense of place, time and context. It's disappointing, then, that this all gives way to such a conventional retelling of the nativity. Having seen this part of the story reworked and reinvented so many times, it's retelling here is entirely devoid of drama, except the slaughter of the innocents. Indeed it seems that Ray intends the main point of the first part of this story to focus on the violent context. Pompey's murder of the priests, the Romans' executions of insurrectionists, Herod's slaughter of the infants and finally Herod Antipas assisting his father's death literally kicking him off his perch. The narration links this all together with the unusual phrase "Herod self-crucified" linking him to both the executed revolutionaries before him and Jesus' inevitable crucifixion. Herod is an evil man, but in a sense he is just another person destroyed by the violence that accompanies the thundering machinery of a violent empire. And herein lies the basis of Ray's gospel: Jesus is a messiah of peace that stands in opposition to all this power and violence. Perhaps this is why there is a such a preponderance of low angle shots in this film, stressing the towering magnitude of the Roman Empire and the lowly humble path Jesus and his followers will undertake. The camera often gazes up at the authorities in this film, but down on Jesus, most notably of course in that camera-attached-to-the-top-of-the-cross shot that is so very reminiscent of Dali's famous painting. That said there are exceptions in both directions: the Sermon on the Mount often captures Jesus from below, but when Salome asks Herod for John the Baptist's head, we get a high overhead God shot, a reminder that what goes on in the private quarters of the powerful and wealthy is still seen and judged by the god who sees everything. However, this is one of the rare occasions where Ray uses some kind of filmmaking technique to force a supernatural interpretation of what we are seeing, perhaps because of the film's interest in power and the use of force. It's notable, for example, that we're treated to a very Markan baptism. There's no literal dove or protestations from John. Jesus may have heard a voice from Heaven, but we do not. Furthermore, whilst several miracles are seen on screen, they don't use special effects. This isn't because the film is low budget, and I don't think it is necessarily to accommodate doubt, but rather that doing so would have forced a particular perspective. Lucius' reporting of other miracles is well documented, but note also how the resurrection is all off camera. I think it's significant that the only time a classic "special effect" is used, it's used by the devil during the temptation, and it's a lurid and unconvincing overlay of a tacky looking city. It's so jarringly out of kilter with the rest of the film's look and feel that it seems deliberate to me. Jesus of course rejects Satan's advances, in fact the first words Jeffrey Hunter utters are "Man does not live by bread alone but by every word of God". Again given Ray's concerns with violence and social injustice this seems significant. Those opening scenes pit Zealots against Romans but sides with neither, because whilst Barabbas and the Zealots are concerned with earthy issues such as! presumably, "bread" Jesus emphasises that some things are more important. As the film progresses, the idea persists that Barabbas's fighters are really just the opposite side of the coin to Roman violence. Jesus' way is radically different. It's interesting that every time there is a big set piece battle in the film, the kingdom of peace is shown going about its business in virtually the same space, but somehow in parallel to the warring Romans and Zealots. So in the opening overview whilst Rome defeats the Zealots Jesus is born. Later when Barabbas's men ambush Pilate's soldiers, the scene is prefaced by footage from just over the hill of John baptising his followers. And, of course, there is Jesus' alternative entry to Jerusalem via donkey which the Zealots attempt to turn into a revolution which ends in them quite literally being trampled into the dirt by the Roman army. There's perhaps a fourth example: in the background when Jesus is crucified there is, to borrow from Welles' opening narration, a sea of crosses - a sign that Roman violence has once again overcome Jewish violence. The other notably unusual use of the camera that Ray utilises extensively in this film is the split-focus diopter lens. (This is a split lens allow one half of the camera to focus on a character in the extreme foreground whilst the other half focuses on a character or object in the background). Despite my familiarity with this film it was a surprise to see it used to widely given that it's a technique largely associated with the seventies. It's used significantly in All the President's Men and on YouTube there are demonstrations of Brian DePalma's repeated use of it in Blow Out. But this was 1961 which makes Ray very much a leader in this field. In high definition there's at least one shot that is useful for demonstrating the technique. After the Sermon on the Mount Jesus and Peter talk and if you look at the tree that runs diagonally across the scene you can see how it moves from being blurred on Jesus' side to being in focus next to Jesus. There are a few other nice camera moments that I had not noticed before. There were a couple of nice compositions I really appreciated this time around. The one at the top of this post is from the Sermon on the Mount, the one lower down is from Jesus' trial. Also between Jesus' arrest and his subsequent death there's quite a bit of footage of Judas including one where he somehow gets literal blood on his hands and another where he witnesses the crucifixion up close and picks up a stone (this doesn't seem coincidental so it's perhaps a reference to the earlier non-stoning of the woman taken in adultery scene). Another character who gets developed in ways beyond their character's development in the Bible is Pilate's wife. Firstly she is involved in discussions that it seems highly unlikely that Pilate's real wife would ever have been. But, in contrast to her waspish, jaded and cynical husband, she is consistently intrigued by Jesus, his message and the stories that surround him. It's stressed that she is Caesar's daughter but she sneaks out with Lucius to witness the Sermon on the Mount. There's a moment of reflection by a pool of water, and most significantly she is present on Jesus' road to the cross. Indeed when he stumbles she even steps forward as if to offer to carry the cross. All this seems in keeping with the moment in Matthew when she warns Pilate of the potential consequences of killing Jesus, but unusually this moment is not present in the film. The film was much cut and perhaps this is a moment that was filmed but ultimately left on the editing room floor. I think the same fate must have accompanied some of the footage of Mary Magdalene. She is present in early scenes, most notably when she pops in for a chat with Jesus' mother, but then she disappears from the film right up until it's time for her to witness the resurrection. However, the main omission that most Jesus films include is the presence of the Jewish authorities. This isn't just about edits in post-production, it's far more significant. Caiaphas is one of Herod and Pilate's cronies, but there are no other Jewish official leaders to speak of, nor are there any Pharisees. Indeed, aside from Caiaphas and Barabbas's dismissal of his significance there is no real opposition at all to Jesus and his message from within Judaism. Jesus trial in from of Caiaphas is given the briefest mention, but the soldiers who arrested him are Roman. Given how many Jesus films have been labelled anti-Semitic, this film goes to considerable lengths to distance itself from any such accusations fitting for a version of the Jesus story that goes to such lengths to portray him as the antidote to violence. Lastly, there is the Great Commission scene on the beach, clearly in Galilee rather than Jerusalem and on the flat rather than on a mountain. Interestingly, immediately after Jesus words the disciples split up and head off in different directions. According to Acts of course, the church clung together in Jerusalem for several years before really splitting up to travel further afield, but it' say nice visualisation of their future. As a big fan of Rossellini's 1950 film Francesco, giullare di Dio (Francis, God's Jester) I can't help wondering if this is a nod to the final scene in that film where Francis' followers spin round until they fall over and then head off in the direction they are pointing. Jesus' method of commissioning may be more serious, but it's message no less important, for those living under Roman rule, for those in 1961 and for us today. The rise of Simon Peter is an unusual one. He shared more or less the same humble roots as Jesus, but whereas Jesus died in almost the same obscurity and with the same low rank as he began, Peter, if the traditions are to be believed, rose to become the leader of the church across the largest and most influential city of the Empire: Rome. 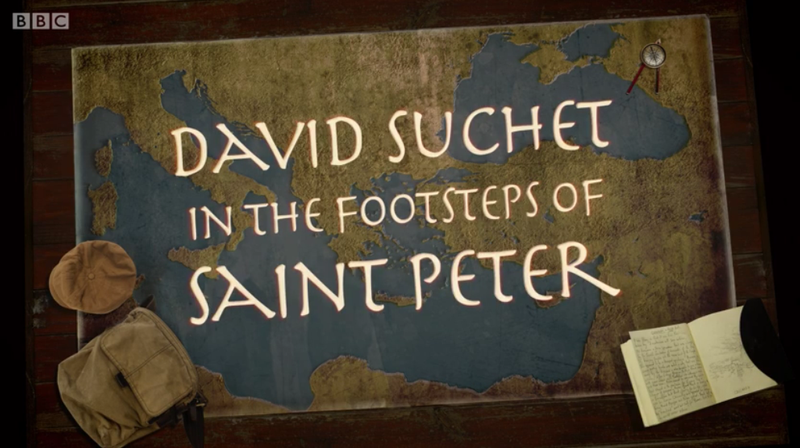 It's this unlikely rise that David Suchet charts in his latest two part documentary for the BBC David Suchet - In the Footsteps of St. Peter. Suchet starts in Rome with an introduction not dissimilar to the one above, before returning to the Holy Land for the rest of the first part of the documentary to examine Peter's life up to the point of Jesus' death. Suchet starts his investigation in Bethsaida, where Peter, then still known by just his Hebrew name, Shimon, was reputed to have grown up. Culturally it was a very cosmopolitan town with a mixture of Jews and other traders from across the empire, indeed Suchet learns that the archeological evidence suggest a very mixed diet was consumed, much of it non-Kosher. Bethsaida was known for its fishing and we're shown fishing net weights and needles that fisherman such as Peter would have used, although the Sea of Galilee has now retreated from where it stood 2000 years ago. From Bethsaida to Capernaum, the alleged site of Peter's mother-in-law's house and a far more Jewish settlement than Bethsaida though still one with a strong fishing industry. Suchet gets to visit the, so called, Jesus Boat and learns a bit about how fisherman like him would have clubbed together with others to go into business. Boats such as this needed crews of five and fishing licences and other expenses would have made the cost quite high. Somehow the notion seems to get accepted that Peter was a middle class business owner, but it does rather seem to beg the question. Another key site on the Sea of Galilee is Caesarea Philippi where Peter, now a firm follower of Jesus declared that Jesus was the messiah and Jesus replies that on this rock he would build his church. But the rock Suchet stands in front of is a large, former pagan shrine. Suchet uses his experience as an actor to draw out some of the ambiguities of the raw text. Did he mean the rock behind him or the man in front of him? Was he pointing at himself or just referring to Peter's words. It's one of the many strengths Suchet brings to his role. As well as his affability with his guests there's a real passion for the subject and an interest in the material. He carries a notebook around with him, but, as the camera occasionally reveals, it's more for sketching than writing, and there's an ongoing sense that Suchet is getting behind the character, trying to understand the character and pick out the drama and humanity in the story. There are some nice moments where Suchet offers a dramatised telling of the story. But the success of this documentary also lies in the way it uses the visuals to make an impact. There is, of course, many a BBC documentary where a presenter goes around getting to see and handle the artefacts that accompany their story, but in addition to this, here the Galilean landscapes and the Roman architecture really add to the scene of this incredible transition. And in HD the overhead footage of Jerusalem looks incredible. One particularly powerful moment in this respect is the visit to Mount Hermon. It's not a scene that appears in many Jesus films and most of those that do portray it were made on quite small budgets. So in my mind I picture a small hill at best. However, the footage of Mount Hermon really brings home the size of it and just as Suchet is dwarfed by the size of the mountain, seeing this new context makes me realise how the disciples must have been dwarfed by it as well, but also of the appropriateness of such a setting for a moment that so emphasises Jesus' divinity. From the Mount Hermon to Mount Zion where Suchet hears about Passover, the temple and learns the context around that strange part in Luke 22:38 where Peter tells Jesus he has two swords and Jesus says that this should be enough. First century Jerusalem, and particularly the countryside around it, was not particularly safe so travellers would bring some form of self defence as standard. Suchet then joins Shimon Gibson on the site of one of his current excavations - a house in Jerusalem. They're there to get a feel for Peter sneaking into the high priest's enclosure where he would deny Jesus. Both Suchet and I are struck by how small the courtyard area is. Whilst it's not hard to imagine the high Priest might live in a slightly grander house than this one, again I find myself having to recalibrate my previous mental images of the scene. Gibson points out that just entering such an enclosed, intimate, yet potentially dangerous space was an act of significant bravery. The final, and all too brief, segment of the first part of the film looks at Jesus' death and burial and the empty tomb on the following Sunday. The key location here is a first century tomb, but there's no mention that being entombed was exceedingly rare for those crucified, and the mention of Peter and the empty tomb, particularly for a documentary running over Easter weekend is particularly lightweight. 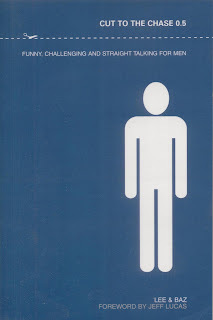 Part one ends with Suchet offering his thoughts and concluding with the question "so how does Peter get from this, the possible lowest point in his life, to becoming, what some people call, the Pope of Rome?" The answer to this question would seem to lie with both the resurrection and Pentecost and, sure enough, part two opens with the story of Jesus appearing to Peter and six of the other disciples on the beach (John 21). There's a lovely shot of fish cooking over an open fire on shores of Lake Galilee, but he discussion about the resurrection is rather scant. It's true that Pentecost (which we come to next) was also very significant to Peter's about turn and that the encounter with Jesus on the beach was personally redemptive. Nevertheless, it's a shame the programme doesn't actually mention that the gospels claim that Peter witnessed the risen Jesus at least three times in the presence of the other disciples and once on his own. The veracity of that claim can be disputed. There are a range of positions on what "resurrection" actually means, and on the veracity and verifiability of those claims. I must admit that I personally am unsure what exactly is to be made of them. But surely the remit of a documentary like this that it should at least examine the crucial moments in the story, even if it ultimately finds them wanting, or, as it more often the case, concludes that whether you believe it all or not is a matter of faith. Following the discussion of Pentecost we move onto Peter's encounter with the Roman centurion Cornelius - "a huge moment for Peter". There's a brief retelling of Peter's escape from Herod's jail before Suchet picks up the trail in Cappadocia (modern-day Turkey). There's some footage of the stunning frescoes carved into the rock in the old St Basil's monastery there and reflections on how the monks there followed the sort of approach that Peter advocated. A brief reference is made to the early chapters of Acts and 1 Peter 3:8-9 is recited. From Cappadocia the story returns to Jerusalem and the council that debated Gentile admission to the church. This felt a little under done, but it's perhaps of less interest in such a visual documentary as this as those parts of the story where historical artefacts or artistic interpretations are quite so stunning. Which brings things nicely to Rome and the Appian way. The focus here is very much on Peter's leadership of the Roman church. Was it likely and how might he have influenced things there? 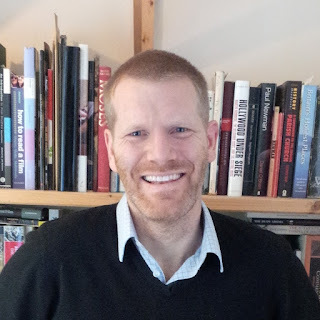 The programme's theological consultant Ed Adams suggests Peter didn't actually found the church in Rome, even if he led it at some point, so the programme moves to the most likely time for Peter's leadership of the church around the great fire in 64 AD. Various experts discuss this informing us that Nero was prone to scapegoating, that he liked making examples of the prominent leaders, but that any such reprisals were more likely to be by burning, beheading or garrotting than by upside down crucifixion. Furthermore, had Peter been upside down it may have been by his request or by the soldiers' own cruel initiative. And so we arrive at the inevitable tour of the catacombs. It's easy to get blasé about yet another documentary trip around the tunnels and chambers underneath Rome. Yet it also seems that every documentary seems to somehow find a fresh part of this underground world that I've not seen before. It really brings home just how unfathomably large the catacombs are and Suchet certain finds some good points of interest in the bit he chooses on which to focus. Having covered a great deal of ground on a horizontal axis, the film's final transition is vertically, back up to the surface and into St Peter's square. Here Suchet chooses to sum up, against the backdrop of Peter's most recent spiritual ancestor arriving in his pope mobile. Even with the current incumbent's drive towards a more humble faith, Suchet cannot escape the disconnect between the finery of today's Vatican and Peter's humble beginnings on the Sea of Galilee. He leaves us with the question that is already in our minds: "What would he have made of all this?" 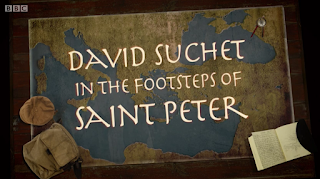 Overall David Suchet - In the Footsteps of St. Peter is a strong and fairly enjoyable documentary owing to a combination of Suchet's affable enthusiasm, a strong range of knowledgeable experts, an impressive selection of interesting artefacts and some impressive photography. It's a shame that the events of the first Easter are rather short changed, but there's much here that even well seasoned fans of Bible documentaries will learn and enjoy. Kate Raphael, Eugenio Alliata, Orna Cohen, Kurt Raveh, Menahem Lev, Claire Pfann, Karen Stern,Ronny Reich, Guy Stiebel, Shimon Gibson. Stephen Pfann, Joan Taylor, Gil Gambash, Daniel R Schwartz, Freda Barut, Helen Bond, Arnold Nesselrath, Edward Adams, Riccardo Di Segni, Thomas Cunnah, Ryan Day, Peter Stoddart, Valerie Higgins, Candida Moss, Jerry Brotton. 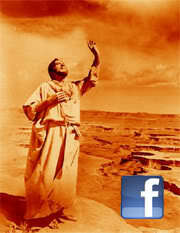 What do "Late Great Planet Earth" and Luis Buñuel have in common? Well if the IMDb is to be believed the answer is Rolf Forsberg. The first part of that comparison is fact: Forsberg directed the 1979 movie based on Hal Lindsay's bewilderingly successful book. The other half of the equation is more open to interpretation. Certainly Forsberg made surreal films about religious issues, of which his first, The Antkeeper is a good example. But I'm not sure how far the comparison goes beyond that. Certainly it flatters Forsberg far more than it does Buñnuel. The Antkeeper is certainly a novel little movie. Just shy of half an hour and the only Jesus-as-an-ant movie I know of. It’s premise is a simple one - to explain the Gospel as a metaphorical story about ants and their watchful keeper. In and of itself the idea will be surreal enough for some, but Forsberg makes a number of choices which move it into the field of the experimental as well as the surreal. Firstly there are some really interesting shots. The opening shot is an ant’s eye view of some grains of sand that look like rocks. There are the extreme close ups of the ants themselves.Then there is the use of light, colour and film-stock. The film uses bright, almost gaudy, colours but there’s a certain translucence about them. Certainly it deliberately eschews a studio feel in favour of a more arty cine camera feel. Lastly there are the portrayals of the characters. One of the characters, Bruja the character who is analogous to the devil, has a bizarre half old-man, half woman appearance. There’s a brief explanation for this, but it’s none too convincing, and really it seems like mainly an artistic choice. It does heighten the bizarre other-worldly feel of the film which some will enjoy, but others will find weird for weirdness’ sake. The problem with the film however is that the metaphorical aspect of the film fails in various significant ways. Firstly, and perhaps most significantly, the God character comes out of it very badly indeed. My daughter hit the nail on the head when she inadvertently called the antkeeper "the Evil Gardener". That was surely not Forsberg’s intention, but my daughter won’t be alone in viewing the character that way. For no reason he bans the ants from part of the garden - a decision that is not only incomprehensible to the ants, but also to us as well. When, despite his command, they visit the garden anyway, he pulls off their wings and banishes them to a barren desert bit of wasteland even though it’s surrounded my lusher looking areas. This touches on the other significant failing that using such an allegory exposes the holes in their narrative. (I say “their narrative” because while The Antkeeper is presented as a metaphorical retelling of the Christian Gospel certain parts of that gospel are particular to only certain groups of Christians. Certainly there are many Christians who would not accept the version of the gospel that The Antkeeper portrays). So taking the examples above the antkeeper’s deliberate maiming of the ants discredits the idea that he has any particular care for the ants. Creating a literal devil character likewise left me wondering why. The analogy makes the original story seem far less credible, rather than more, which surely cannot have been the original intention. Finally there’s a problem with the chosen allegory itself. In order to get the analogy to work the film has to anthropomorphise the ants. This then reverses the flow of the metaphor. The ants think and act like humans to the extent that it might just have been easier to tell an allegory using human characters. The metaphor is not without its strengths - the idea of a God that is to us like a gardener might be to an ant is an interesting idea, and it may help viewers to think more about how earth-shattering the idea of the incarnation is - but the best aspects of the film are its visual ideas rather than it’s theological ones. The Antkeeper is available on DVD as part of the Gospel Film Archive's Easter 2015 Collection. The GFA provided the disc for this review. There's a little more on the film at the Christian Film Database.